David Berger is a native of Saratoga Springs and graduated SUNY Albany with a BA in Sociology and Music. 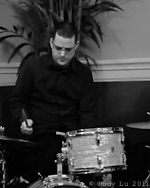 After a 10 year run in New York City, intensive study at the Drummer’s Collective (Mike Clark, Ian Froman, Peter Retzlaff), and hundreds of gigs (Smalls, Cornelia Street Cafe, etc..), he now resides in Beacon NY. Past and Current collaborations include: Joe McPhee, Eric Person, Joel Frahm, Mike Dopazo, Travis Sullivan, John Menegon and Teri Roiger, Michael Bisio, Michael Louis Smith and the Left Ear Trio, Groovestick, Jessica Jones Quartet, Bobby Previte’s Blueprints, Nick Mancini, James Keepnews and Plan B: From Outer Space, Keith Pray, Brian Patneaude, John Leroy and Duocracy..